Once upon a time there was a stunning young women. She took pride in her healthy hair. But, she lived during some scary times the zombie virus was just being released. She was one of the first to be infected. She thought it would be the end of her social life. Little did she know zombie parties are where the fun is at. 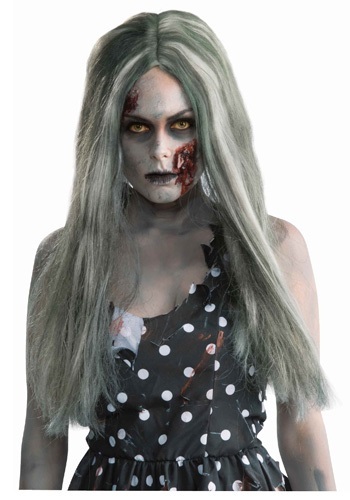 She was still beautiful, and all of her other friends called her zombie chic. You can be just like her in the Creepy Zombie Wig. Get ready to look good for the next zombie bash with the highest fashion in the zombie world. Right now long white hair with greenish blue highlights are all the rage in the un-dead fashion community. But, don't worry the hair isn't made from any zombies, rather it is 100 percent synthetic.